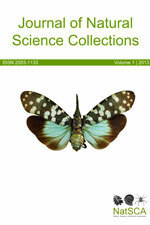 The Natural Science Collections Association (NatSCA) is proud to announce the launch of the Journal of Natural Science Collections, a brand new peer-reviewed journal for people working with natural science collections. The new journal replaces the NatSCA News (2003-2012) and its debut issue is hot off the press and making its way to NatSCA members around the World. The new Journal of Natural Science Collections is central to NatSCA’s mission to support natural science collections, the institutions that house them and the people that work with them, in order to improve collections care, understanding, accessibility and enjoyment for all. All articles are peer reviewed by external reviewers, chosen for their subject specialist knowledge to ensure quality. The new journal will be published annually, providing a platform for professional development within the sector and a showcase for research on natural science collections worldwide. We encourage submissions from anyone who works with, or otherwise uses, natural science collections. The first issue includes eight articles covering advocacy, collections review, specimen conservation, visitor experiences, collections management and the application of new technology that can help improve sustainability in museums. Contributing authors represent a wide cross-section of the natural sciences collections community including staff, volunteers and freelancers working in curation, conservation and education, and representing Local Authority, University and National Museums. Future articles will include topics which further NatSCA’s mission and which help develop a deeper understanding of the value of natural science collections. Through the new journal, we hope to promote the use of collections, further develop a community of professionals, improve standards within the sector, and strengthen NatSCA’s position as an advocate for the natural science collections of the UK and Ireland. Volume 1 of the Journal of Natural Science Collections marks the 24th journal published by NatSCA and 10 years since the Natural Science Collection Association was formed by the merger of the Biology Curators Group and Natural Sciences Conservation Group in 2003. The journal will be provided to all NatSCA members and after one year the articles will be made freely available for all online at http://natsca.org/pubs. You can download a PDF press release here.